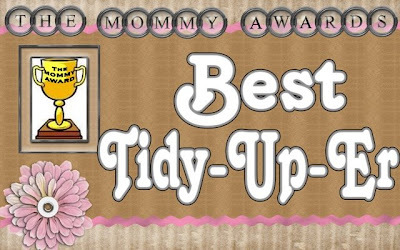 Way to go - you are the Tidy-Up Mom of the Week. Now that I am wrapping things up, I am wondering why I didn't ask you all some of your tips to make cleaning a more enjoyable and/or productive activity. So, I think I will revisit this topic soon. I am looking to get all the tips I can get. And we just need to let Tia enjoy her award - hee hee! So, I found a lot of comfort in your responses last week - I was so glad to hear that I am not the only person that feels "okay" about the whole cleaning thing. I love the result, but the actual process is not too exciting to me. 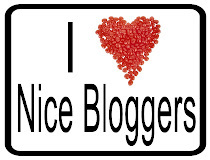 And for those of you who responded "great", would you mind emailing me so that I can know who you are - I think I need to spend more time with you so that some of your energy can rub off on me! And more of us think our homes are half clean, half needing more attention - that sounds like me, too. I long to have a home that is tidy all the time, but haven't figured that one out yet. Working on it, though. Now, as far as the actual jobs - there were some winners amongst the favorite jobs: almost everyone prefers vacuuming and making beds - hmmmm - can we say instant gratification? Those are my favorites. And as for the least favorites - again, some agreement: scrubbing the toilet and cleaning out the fridge. As much as you get instant gratification from the toilet scrubbing, it still is not a fun process. And the fridge thing - it's so depressing to through out all that food you let go to waste. Bummer. Anyhow, this was fun, and I really do want to know who answered "great" about housekeeping. And I want to send hugs to those who answered "hopeless".